Overcome by the hitch-itch and being tired of the ever-present dust clouds surrounding our travel trailer in the RV Park, we opted to move on to new adventures last Saturday. I have to say that although the Pilot Knob RV Park was very nice and the warm, above average temperatures in the area were a plus, we felt like being at central station with the barrage of new arrivals and departures that had been churning up the dust while traversing by our site all day long since the RV show in Quartzsite closed. Yuma had been a great city for all of our shopping needs and I’ll be missing the Albertson’s grocery store. 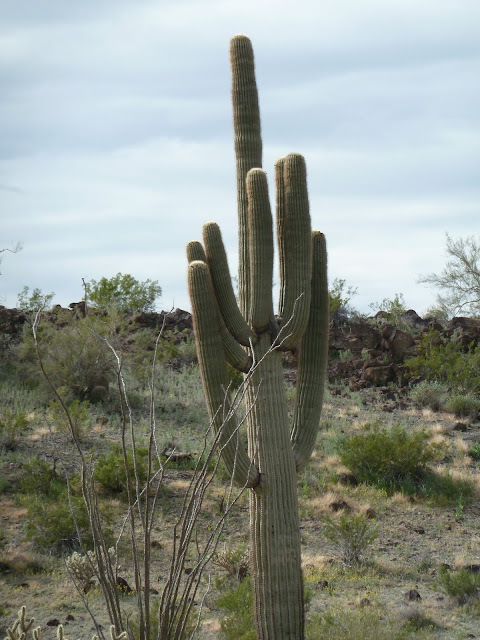 First we headed east on I-8 and then onto I-10 where on long stretches the landscape is speckled with saguaro cactuses. For us Canadians it is an amazing sight because we don’t have those back home. Those cactuses can grow to great heights, apparently to over 40 feet tall, but I haven’t spotted one that tall yet. Our destination was the "K&N RV Park" in Whetstone, part of Huachuca City, Arizona. 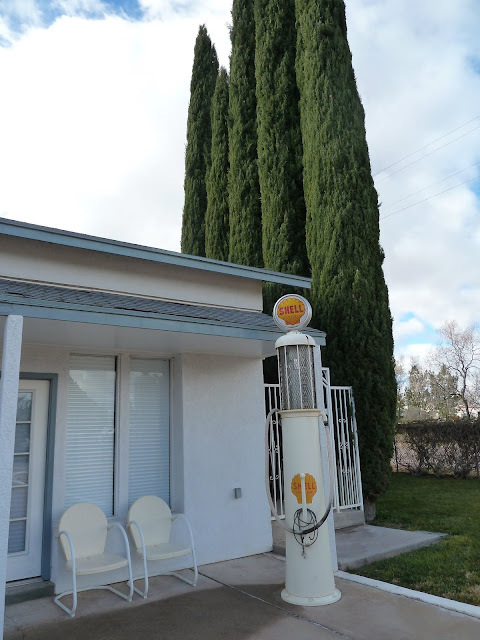 This little gem of a traveler’s heaven is tucked away off Arizona State Route 82, passed the intersection of Hwy 90. It is a small park with views of mountains all around no matter which way you look. The park is filled up to 75% and the sites are spacious with gravel, the roads are paved, there are picnic tables everywhere with a few BBQ areas, horseshoe pits and two fenced-in dog parks. There is free wifi throughout the park. The only sounds we hear are the birds chirping in the trees. Opposite the entrance, at the end of the three laneways is a gate and beyond is the estate of the park’s owners. The office is located in what looks like a funky, old style Shell Gas Station from the days when a pack of cigarettes cost 10 cents and a gallon of gasoline was 26.9 cents! The owner is a collector for antiques and the outside of the building as well as the office/reception are furnished with authentic pieces of years gone by, very unique and beautiful to look at. Our two doxies sure love the freedom of running around in the dog park without their leashes. Can you tell? Four years ago we were here in the area but in a differed RV Park for a couple of months and we really liked the many attractions this region has to offer. There are some, which we didn’t get to visit, and some we may want to revisit, so stay tuned to see what we are up to next. Too bad that you don't have Solar Panels on your trailer as you would have truly enjoyed being in Quartzsite. Elsa and Reggie are enjoying their freedom. Be Safe and Enjoy the warmer then Ontario temperatures. Solar panels would help for sure to keep hydro costs down wherever we get charged in kilowatts. Pilot Knob didn't charge for electricity though, it was included in the monthly fee. Enjoy your time there, we do love Huachaca city area. higher elevation and cooler so many more sites to see there as well. Was hoping to catch up with you at a Pilot knob again maybe another time, Travel safe and enjoy new adventures. Yep, there is lots to see and do here. Temps are a bit cooler but not too bad. We were hoping to meet up with you guys again and maybe at another place? It's a small world, you know. Yes was looking forward to time together at Pilot Knob just the 4 of us hopefully another time..
We have driven by that park to check it out. Stayed at Quail Ridge near by. As George says, there is lots to see in the area. Take care and safe travels. Yes Bill, there are several parks within the vicinity we are familiar with. Lots of RVs are here this time compared to four years ago when we were here last. Seems many people are traveling nowadays. Know what you mean by all the dust in that Pilot Knob area. We boondocked there one night about 10 years ago and that was enough for us. We never did return to that sandy area again. The area you are in now is superb and one of our all time favs. lots of great mountain drives all around you. Be sure to get over to Bisbee. Al we loved Bisbee and will go there again. The scenery around it is wonderful. No wonder that you like this area, a feast for the eyes. It looks like a lovely park. Up where you were placed in Pilot Knob was not the best location. We didn't notice the dusty sand as much back where we were. the doggies indeed look happy, they need doggie parks to run free. Patsy ever since the Quartzite show finished there was a stampede of RVs heading for Pilot Knob. With a smaller travel trailer we did not have the choice of a better parking site and every rig that came and went drove by us. It's a nice RV Park for sure and if we would have had your previous spot we'd be very happy. Reggie and Elsa love the two dog parks! Oh my, what a huge off leash area. I love the quaintness of the office and your photos of the park. Looking forward to more posts. Very cool office in that park! 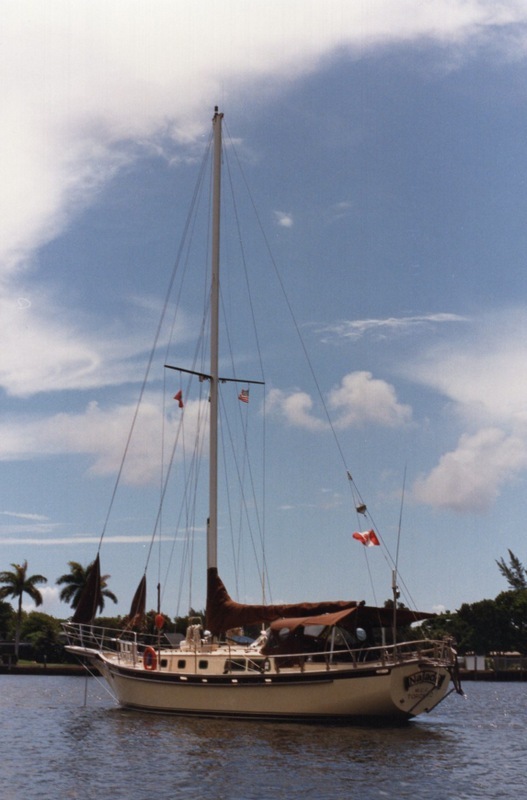 “Najade” a 37-foot sailboat became our home from 1982-1987, taking us across the Atlantic via Bermuda and the Azores to Europe, through the French Canals into the Mediterranean Sea, visiting lovely Italy, Spain, Greece, Turkey, Tunisia, Mallorca, Madeira, the Canary Islands and back over the Atlantic to the Caribbean Islands, the Bahamas, Florida and back to Canada. We were pretty young back then and in order to pay for this trip we sold all of our possessions, the townhouse, the car, the furniture and everything else. Oh, and we built the boat, too! Back then there was no Internet but we kept a logbook and took mostly slides. Check Najade pics for more info. How much juice is in your 12 Volt Battery? And people think the desert lacks color!